Tag line: "I warned you not to go out tonight"
A remake of the classic 1980 William Lustig-directed slasher, 2012’s Maniac takes a much different approach to the story than its predecessor. Frank (Elijah Wood) is a serial killer, a guy who murders women, scalps them, and then attaches their hair to mannequins that he keeps in his room (which he then treats as if they were alive). One day, Frank encounters a beautiful photographer named Anna (Nora Arnezeder), with whom he falls in love. Over time, he attempts to strike up a romance with her, but can Frank control the impulse that causes him to kill, or will Anna become another of his victims? Unlike the Lustig original, this Maniac is told almost entirely from the first-person perspective of its lead character, with the majority of the film shot as if we were looking though Frank’s eyes, watching as he stalks and kills several unsuspecting young women. In one scene, he’s on a date with Lucie (Megan M. Duffy), who he met while perusing an online dating service. The evening starts innocently enough; Frank and Lucie have dinner at a nice restaurant before retiring to her apartment for a nightcap. But when she tries to seduce him, Frank can no longer control his urges, and because we’re seeing the world as he sees it, we watch him choke the life out of this poor girl. Despite the fact his face is concealed through much of the picture (we catch the occasional glimpse whenever his character looks into a mirror), Elijah Wood is at his creepy best as Frank, a man so tormented by the memory of his prostitute mother (America Olivo) that it causes him to kill. Whether having an innocent conversation with Anna or stalking his latest victim, Wood is positively chilling throughout the entire film. As violent as the original Maniac was, this newest version “ups the ante”, so to speak, by forcing us to look through the eyes of a killer. 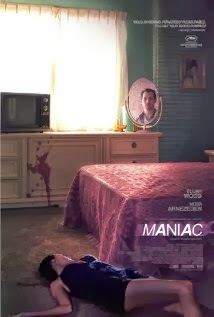 Like the ‘80s movie, this is a blood-soaked film, yet more than that, 2012’s Maniac is an incredibly unsettling one; an on screen murder is rough enough, but peering into someone’s eyes as they gasp their final breath? That’s damn near unbearable. Never heard of this one, but creepy Elijah Wood has officially put it on my list. Don't think I show granny this one. Good pick. Can't say I loved this one too much, but the gore definitely showed up when it needed to, just in order to spice up the story a bit. Wasn't sure if I should watch this when it came out, but I am convinced I probably should now.